As a global total roads claim a life every 30 seconds. That's approximately four lives for the time it will take you to read this article. Four. People. Britain's roads though have never been safer. As of 2016 Britain's road deaths dropped to 1827, a record low out of a total of 129,986 road incidents. For us though, as caravan enthusiasts, we believe that Britain's roads could always be safer. That's why last month we analysed Britain's most dangerous roads, helping to highlight the junctions and highway stretches that are statistically just too dangerous. To follow up this study, this month, we're analysing the driver. Out of the 129,986 road incidents we've analysed over 70% of the incident blame was put down to driver error, making drivers responsible for 90,990 of Britain's road incidents. So who are these drivers that make Britain's roads so dangerous? What age are they? What gender? Where are they from? And, more importantly, what brands and models are they driving so we can avoid them? To find out, we've data-mined through every road traffic incident in the police database to uncover the secrets of Britain's best and worst drivers. While women are often accused of being the worst drivers, the data seems to support the opposite argument. Men are the drivers in double the number of incidents to women with a total of 87,407 car incidents last year compared to just 38,757 incidents by women. Whether this huge disparity in the figures is down to more men taking up occupations involving cars (taxi drivers, truck drivers, delivery drivers etc.) or that men are genuinely inferior drivers is clearly up for debate. What do you think? As the saying goes 'You can only be a good driver, if you are an experienced driver'. But does the saying stand up to data? Well, in fact, yes it does. Drivers under the age of 35 make up over 42% of drivers involved in car incidents with far fewer of the age group on the road than drivers of any other age group. The best drivers are the 56-65 year old age group who are involved in only 11% of crashes, but make up over 30% of licensed drivers. Regionally, this is where the data gets quite interesting. The population of each region varies quite dramatically in the UK, so for fairness we've made a ratio comparative to each regions population. For example, London has the worst drivers in the UK as they have a population of 8,674,000 and 25232 car incidents. That works out at 1 in 343 drivers were in a car incident in London last year. Compare that to the North West of England which has the safest drivers as the region only has 1 in 538 involved in a car incident last year. So which city has the worst drivers? In terms of the highest number of incidents, Birmingham had nearly 3000 car incidents last year. The highest of any city outside of London. When you take population size into consideration though the southern city of Brighton comes out on top with 1 in every 200 drivers in a car incident last year. Interestingly, the safest city in our analysis was Manchester. Drivers in the Northern city experience 1 incident for every 3527 drivers. So far the data has shown that men, aged 26-35 and living in London or Brighton are Britain's worst drivers. But which cars are these people driving? To find out we have again data-mined through the 129,986 road incidents in Britain last year this time analysing the brand and model of the car involved in each incident. Again, similar to the regional and city analysis, we've developed a ratio to account for the disparity in the number of registered cars. For example Honda, as an overall car brand, was involved in 7378 car incidents last year. With 1,083,075 Honda's on Britain's roads, that works out at 1 in every 146 Honda's were involved in a car incident. Interestingly Volvo, which is renowned for car safety, came second in our incident by brand analysis with 1 in every 156 involved in a car incident last year. Another notable brand in our analysis is the prestigious Mercedes-Benz. With the price of a Merc starting out at way above £30,000 you would have assumed that drivers would take a little more care in their prized possession. As it turns out, Mercedes drivers finish in our top four with 1 in every 172 Mercedes drivers involved in a car incident last year. The safest brands in our analysis were the two smaller car brands in the Fiat and the Mini. Fiat drivers only experience 1 incident in every 547 with Mini following closely behind with 1 incident in every 396. 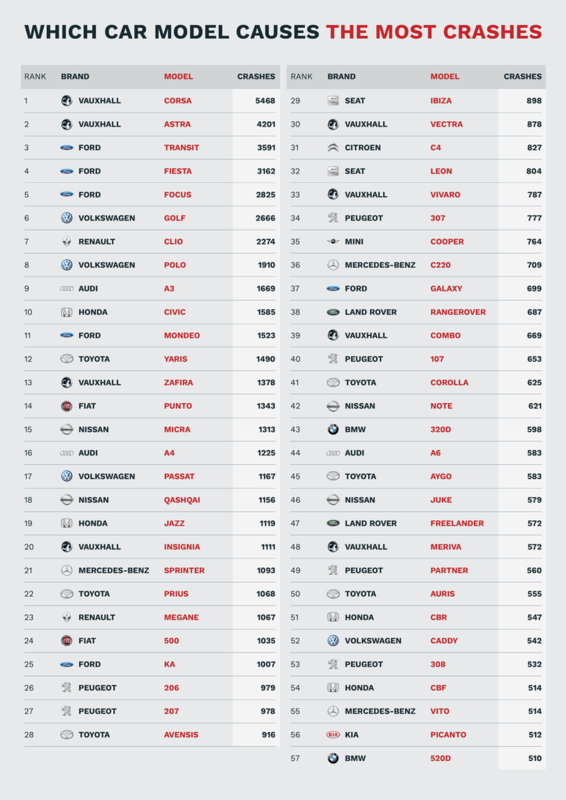 While the data shows that Honda and Volvo's are the car brands you should be avoiding at all costs, which car models specifically should you be avoiding? Unfortunately we don't have the data on the number of specific models registered in the UK to create a ratio, but the data is still quite interesting. For example, the car model with the most car crashes is the Vauxhall Corsa. This car would often be associated with a younger demographic as the 'perfect first car'. This would correlate with the data regarding car incidents by age. Similarly, another car that correlates with the data regarding car incidents by gender is the Ford Transit Van. This vehicle is traditionally used by builders, which are traditionally male. Builders often have to transport a lot of goods and are often under significant time pressures. This could add support to the argument that men are involved in more car incidents than women because of the typical job roles they find themselves in. Killing hundreds each year, driving under the influence of alcohol is one of the most irresponsible acts a driver can commit. 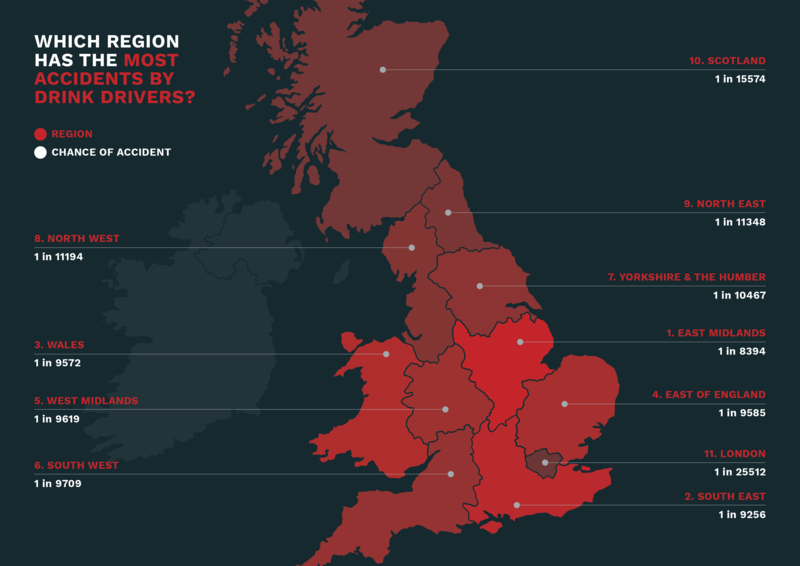 So who are the UK's drink drivers and where can they be found? Using the same police data on car incidents across the UK we've been able to analyse specifically the cases that involved drinking driving. The results are intriguing. Men are nearly twice as likely to drink drive when compared to a women. In the data only 5.5% of women were found to be drink-driving compared to nearly 10% of men. Is this, again, similar to the gender analysis at the beginning of this article, a correlation with more men on the road in driving specific roles leading to higher rates of drink driving? Or are men generally more reckless in their driving behaviour? The results are up for debate. In our age group analysis the results are far more interesting. Our assumption was that the younger age groups would dominate the results with maturity causing the numbers drink driving to drop off dramatically. While the results did drop off, they only declined a total of 3.1% across all age groups. Compared to our general gender analysis at the beginning of this article that is a tiny reduction across the 30 year age difference analysed. In our final analysis we were able to look at drink driving from a regional perspective. Similar to other parts of this study, we've created a ratio to take into consideration the population of each region. For example, the East Midlands is the worst region for drink driving in the UK with 540 drink driving incidents and a population of 4,533,000. That works out at 1 person in every 8394 in a drink driving incident in the East Midlands last year. 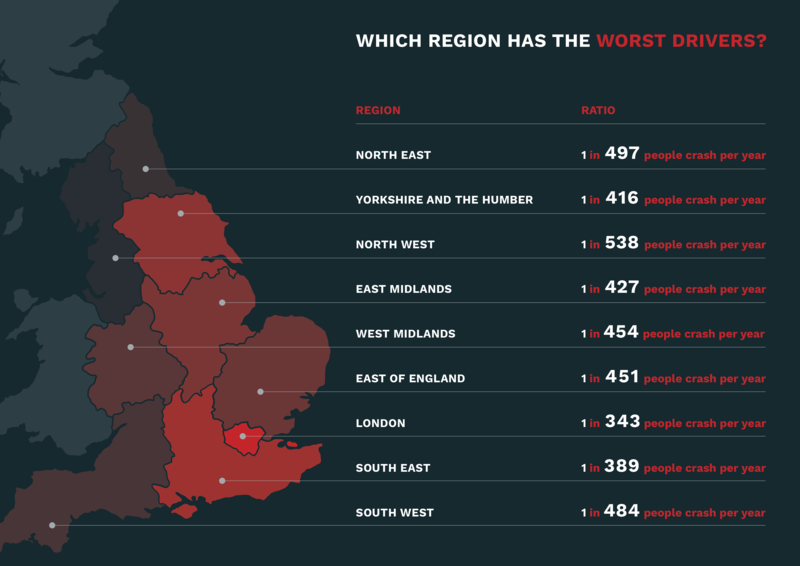 Compare that to the best region in our analysis which was, surprisingly, London. With a total of 340 in a drink drive incident and a population of 8,674,000, the capital only had a ratio of 1 in every 25512 involved in a drink driving incident last year.